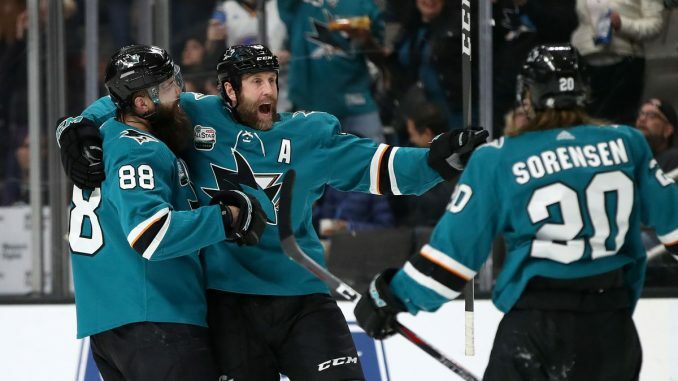 Many congratulations to the San Jose Sharks who clinched a berth in the Stanley Cup Playoffs after the Minnesota Wild lost to the Colorado Avalanche 3-1 on Tuesday. The Sharks are hot on the heels of current leaders the Calgary Flames in the Pacific Division of the Western Conference, trailing them by just three points. The Nashville Predators moved to within a single point of first place in the Central Division with a 3-0 win against the Toronto Maple Leafs at Bridgestone Arena on Tuesday. Pekka Rinne was in outstanding form, turning away 22 shots in his fourth shutout of the season for the Predators who trail the Winnipeg Jets. Jaden Schwartz completed his fourth NHL hat trick and picked up an assist for the St. Louis Blues in their 7-2 victory against the Edmonton Oilers at Enterprise Centre on Tuesday. The Tampa Bay Lightning were crowned Atlantic Division Champions of the Eastern Conference and Presidents Trophy winners with a 4-1 victory against the Arizona Coyotes at Amalie Arena on Monday. Steven Stamkos netted his 384th NHL goal to pass Vincent Lecavalier and become the Lightning’s all-time leader. The Lightning have won five straight and will also have home ice advantage throughout the Stanley Cup Playoffs. The Washington Capitals regained first place in the Metropolitan Division with a 4-1 victory against the New Jersey Devils at Prudential Centre on Tuesday. Brett Connolly netted his 20th goal of the campaign, as the Capitals moved two points clear of the New York Islanders with nine games remaining. Congratulations to the Calgary Flames who have clinched a berth in the 2019 Stanley Cup playoffs, after the Minnesota Wild lost 3-2 in overtime to the New York Islanders on Sunday. The Flames, who currently have a 44-21-17 record, are the first team from the Western Conference to clinch a play-off spot and will join Tampa Bay from the Eastern Conference. Tampa Bay Lightning became the 12th team in NHL history with at least 55 wins in a single season after defeating the Washington Capitals 6-3 at Amalie Arena on Saturday. Alex Killorn bagged a hat-trick, with Nikita Kucherov claiming two assists as the Lightning (114) broke their record for wins and points in a season set in 2017-18 which was 113. Currently, Tampa Bay lead the Boston Bruins by 19 points for first place in the Atlantic Division. A fitting tribute to celebrate Pittsburgh Penguins Evgeni Malkin reaching 1,000 points, saw the legends Sidney Crosby, Phil Kessel and Kris Letang join Penguins owner Mario Lemieux to honour the centre for reaching the milestone before the Penguins game against the St. Louis Blues on Sunday. The NHL have announced that it will be holding its first outdoor game in a non-NHL Canadian city when the Winnipeg Jets will entertain the Calgary Flames in the 2019 Tim Hortons NHL Heritage Classic at Mosaic Stadium on October 26th. It will also be the 28th NHL regular season game played outdoors.